Often imitated, but never duplicated, natural stone is an investment in your home that brings timeless aesthetic rewards. The beauty and range of colours is matched only by its durability and longevity. With time, natural stone adds to the beauty and value of your home. So, prepare to enjoy your investment for years to come. Granite countertops are often one of the most visually impressive aspects of a modern kitchen, and the craftsmanship and quality of work that goes into your countertops can make the difference between ordinary countertops and granite countertops that are truly impressive. 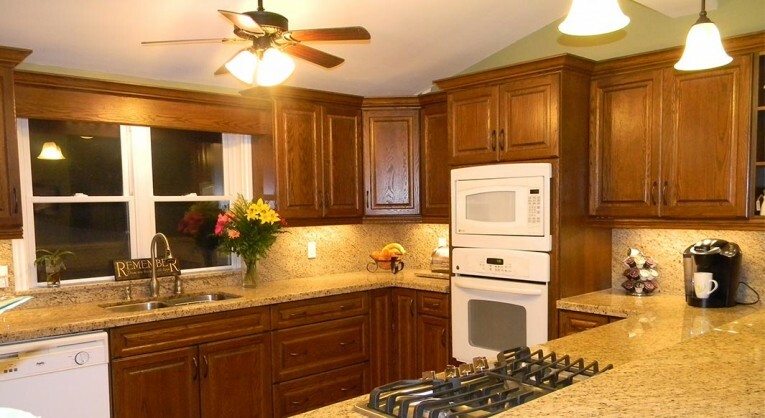 Northern Marble And Granite has the skill and experience needed to ensure that your granite countertops are finished to the utmost standards of excellence. We can incorporate unusual features, designs and edge treatments that make your kitchen into a beautiful, usable creation you will enjoy every single day. NMG has completed the granite countertops in some of Northern Ontario’s most distinctive kitchens and is renowned for being the best in the granite business. Please feel free to browse through the collection of completed customer kitchen projects. All products of nature, stone samples are intended to represent the quarry’s product. However, the material quarried at one time may differ slightly in colour and veining from a sample or photograph. Even a single granite slab will possess a certain amount of colour variation from one end to the other. Many consumers welcome this variation of natural stone. Because of the unique qualities of granite, we recommend viewing real samples of current in-stock material. If you are looking for examples of our completed work and products, simply hit the Kitchen Products link to the right for complete kitchen countertop samples. Please Note: All natural stones are products of nature and vary in color and markings. These variations are characteristics of natural stone and give the material its uniqueness and dramatic beauty. Variations of shade, pattern or color within the same slab or same bundle of slabs are inherent in natural stone and will differ from piece to piece (countertop to countertop, slab to slab). Images may also appear to shift in colour according to your viewing device. As such, we recommend viewing actual material in person to ensure selection satisfaction. Thank you both for all that you have done for us, and for your patience. You made the entire process comfortable and worry free. 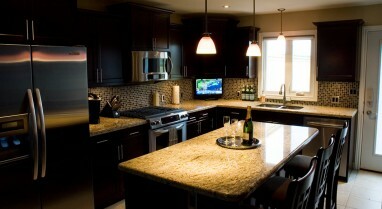 We have received nothing but raves about our kitchen; in particular, our countertops. Please know that should anyone ask our opinion, it will be our pleasure to offer you and your company our enthusiastic recommendation.